Dispensing Blender without drips and dribbles. Wave-Action system continuously pulls mixture down into the blades for smooth results. 48 oz. dishwasher safe DuraBlend jar. Convenient spout cap replaces the dispenser for traditional blending. Patented stainless steel Ice Sabre blades. 4 speeds plus pulse, 500 Watts peak power, and 3 year warranty. Price $25 Based on the manufacturer's suggested retail price (MSRP), this blender is LESS EXPENSIVE THAN AVERAGE and is priced in the BOTTOM 1% of all blenders. Watts The BL10450H is LESS POWERFUL THAN AVERAGE and ranks in the BOTTOM 28% of all blenders. 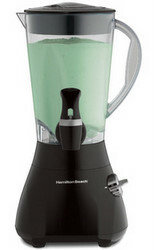 Years This blender has an AVERAGE WARRANTY LENGTH when compared to all other blenders. Stars Based on actual user experience and reviews, this blender is RATED ABOUT AVERAGE by 130 USERS when compared to all other blenders. 73% of users rate this blender favorably. I bought this blender a couple of weeks ago with the express purpose of making blended coffee drinks. I was skeptical that it was going to do a decent job of crushing the ice but as long as I added liquid it did an awesome job. I've been making lots of smoothies, and they take minutes to blend and clean up. Plus, all the ice gets blended perfectly. You will be so happy you bought this. This model is very easy to clean and works great! I've used it many times alreay and it's so easy. We love it! For a blender that lasted 5 months, I don't think it's worth the money. This blender really does dice every bit of ice cream and/or ice I've put in it. Makes great smoothies and milkshakes. Plus the best part is how easy it is to clean.